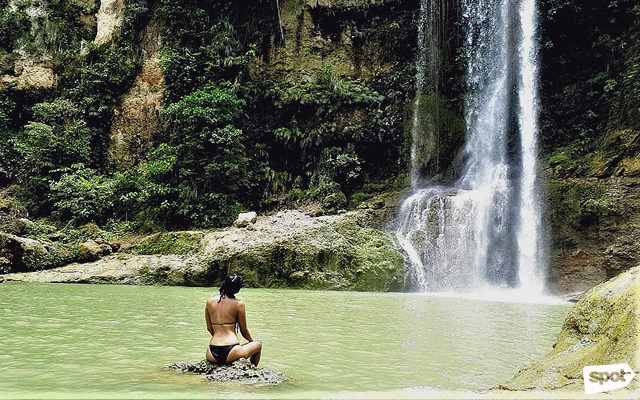 There's more to see beyond the Chocolate Hills and tarsiers! (SPOT.ph) Mention Bohol and several images come to mind: Chocolate Hills, centuries-old churches, powdery white-sand beaches, and the tarsier, the world’s second smallest primate. But beyond these attractions, the island province is a treasure trove of wonders that have made it a tourism hotspot in the past two decades. Its beautiful countryside dotted with scenic vistas, historic landmarks, and a host of unexpected finds make it a sought-after destination for road trips. 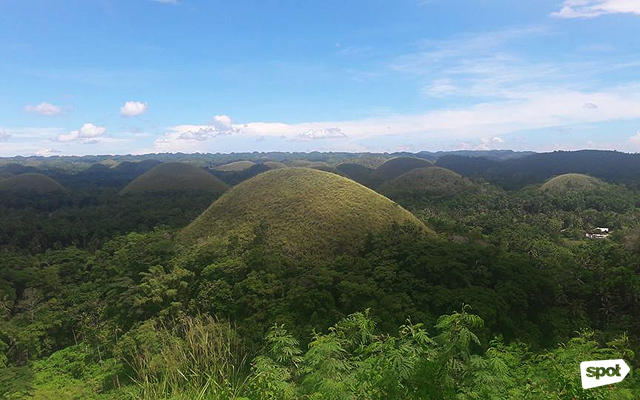 Spread out in Bohol’s central area, these more than 1,260 iconic geological landmarks can be chocolate or green in color, depending on the time of the year. The view deck in Carmen is the best vantage point to marvel at these perfectly sculpted mounds. 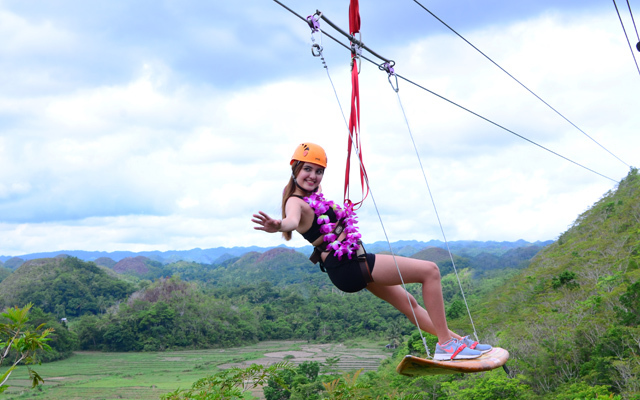 For a dose of adrenaline, go to the nearby Chocolate Hills Adventure Park for the 550-meter long “The Rush” bike zipline, “The Wave Runner” surfing zipline (the first and only of its kind in Asia), Tree Top Rope challenges, ATV rides, biking, and horseback riding and a host of recreational activities in the middle of the sprawling hills. 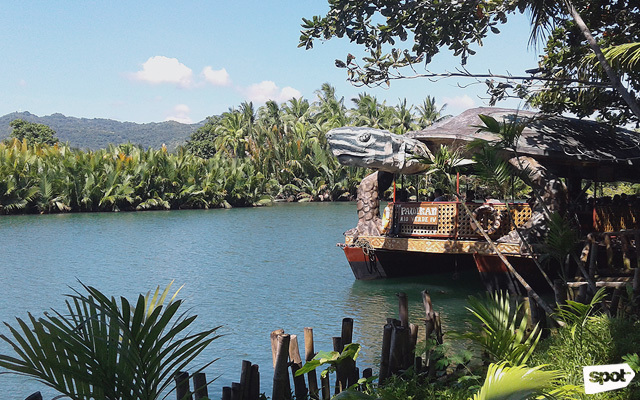 At lunch time, swing by the rustic town of Loboc, which is noted for the panoramic lunch cruise along the placid Loboc River. It has a station along the bank for a cultural interaction with a community musical ensemble. For a dash of fun, treat yourself to animal encounters, go horseback- or buffalo riding, or glide through a tram or zipline at Zoocolate Thrills Adventure Park. The serene river is also perfect for kayaking and stand-up paddling. 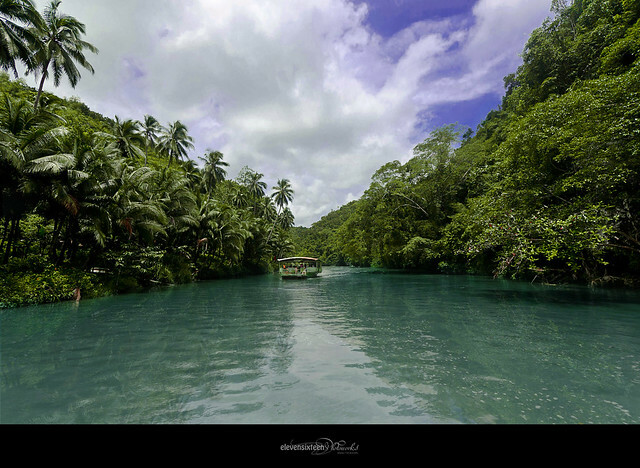 Downstream of the Loay-Loboc River is Rio Verde Floating Resto, which offers a less-crowded lunch cruise with onboard music and a “meet-and-greet” with the Ati tribe at a riverbank village park. At night, it offers an intimate dinner cruise and firefly tour. Another option is the Abatan Life River Tour which cuts through the towns of Antequera, Balili, and Cortes. The three-hour tour includes five pit stops where guests are entertained through live cultural shows by the residents. Up north in Buenavista town is Cambuhat River Village Tour & Oyster Farm where you cruise around a lush mangrove forest and aquaculture farms. 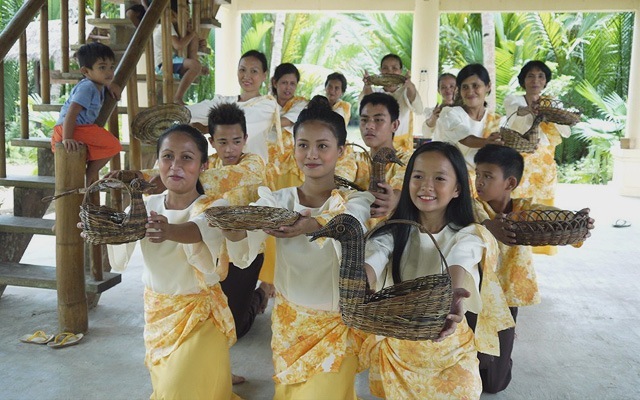 You can also learn the Buri dance performed by the locals which depicts buri product processing. 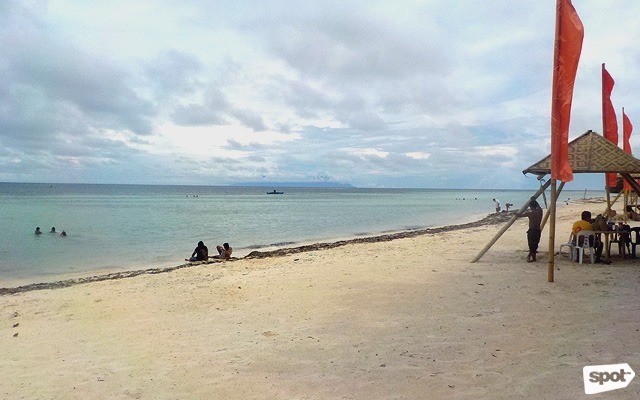 With a long circumferential coastline, it boasts some of the finest powdery white-sand beaches on Panglao Island. Alona, a public beach, is teeming with specialty restaurants, watering holes, spas, and al fresco barbecue grills, much like a smaller version of Boracay’s Station 2. Upscale resort hotels like Bellevue, Eskaya, Amorita, and Bohol Beach Club all have expansive private beaches minus the madding crowd. Another getaway is Quinale Beach in Anda, and the couple of coves scattered in the town’s long coastline, which you can have all to yourself on a lucky day. 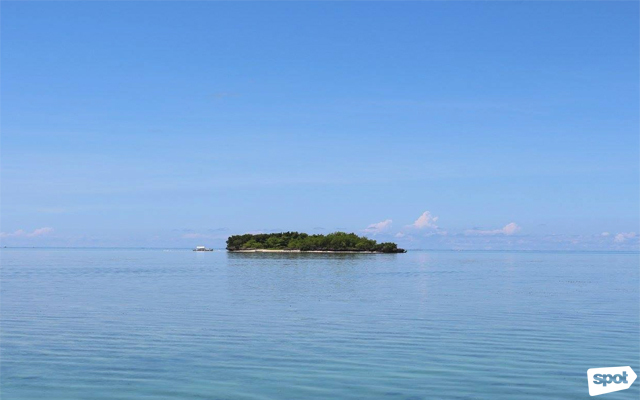 La Manok is a mystical uninhabited islet dotted by burial caves where civilization in the Visayas flourished. The islands of Cabilao in Loon, Pamilacan in Baclayon, Pitogo in President Garcia, and Hingutanan in Bien Unido, are among the hundreds of idyllic isles you can explore in different parts of the province. 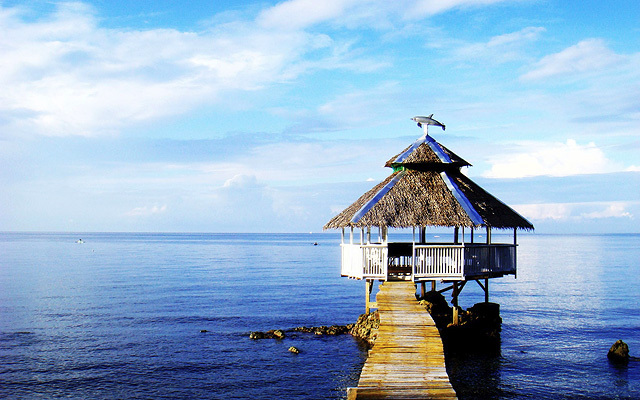 Bohol is a global mecca for scuba diving because of its underwater wonder. Divers from all walks of life converge here to marvel at the marine biodiversity which is among the best in the world—schools of jacks, sea turtles, sardine run, dolphins, whales, lush coral forests, and an assortment of fish species. Balicasag is a must-dive spot with more than a dozen sites around it. Balicasag Island Dive Resort is a tropical-themed lodging which also offers fun dives, certification courses, and group dives. 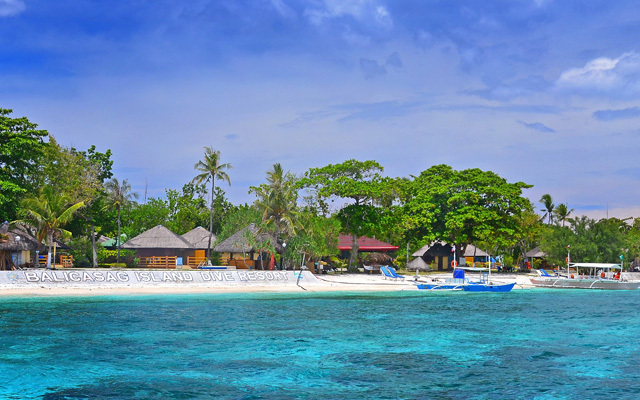 Panglao also prides itself in its rich marine life just a hundred meters away from its shores. When diving around the area, make sure that you are dealing with members of the Panglao Association of Dive Operators for a hassle-free expedition. 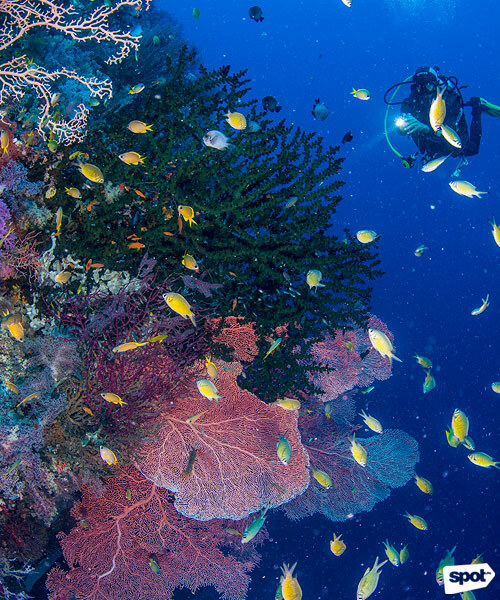 Other diving havens in Bohol are in the nearby towns of Loon, Jagna, and Anda, and Bien Unido further up north at the Danajon Bank, the most massive barrier reef in the country. 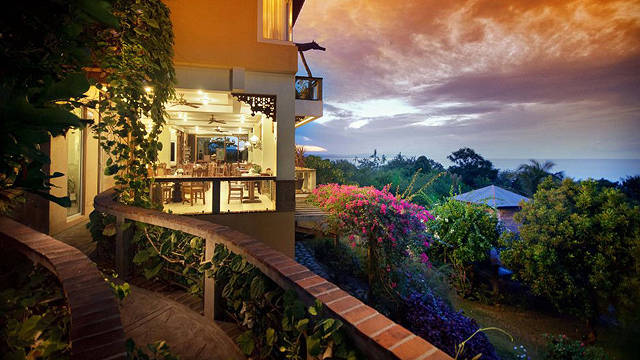 The island’s hilly terrain is gifted with numerous waterfalls with tall drops that are sights to behold. The water forms a clear icy natural pool perfect for a rejuvenating dip. Among these wondrous sights are Can-Umantad Falls in Candijay, Mag-Aso in Antequera, Camugao in Balilihan, and Ingkumhan and Pahangug (Twin Falls) in Dimiao. 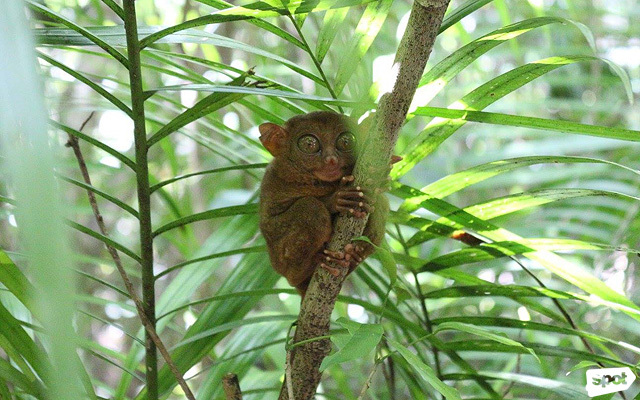 Get up close with one of the world's smallest primates at the Philippine Tarsier and Wildlife Sanctuary in the forests of Corella. 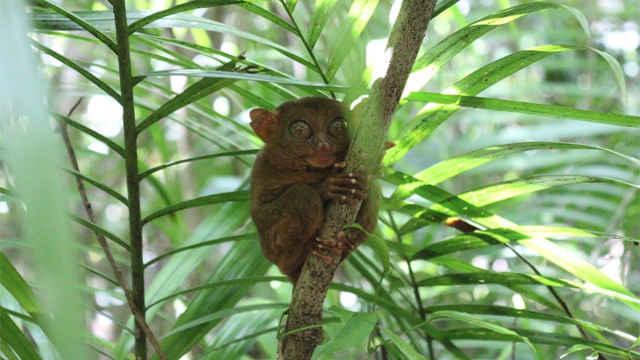 An arm of the non-stock Philippine Tarsier Foundation, it seeks to conserve the tarsier and its habitat from extinction through environmental awareness, research programs and establishment of protected wildlife areas. The 167-hectare timberland is administered by the Department of Environment and Natural Resources and is part of its Social Forestry Project. Be careful of zoo-like roadside establishments posing as “tarsier sanctuaries” where the primates are uprooted from their habitats and caged for tourists’ enjoyment. 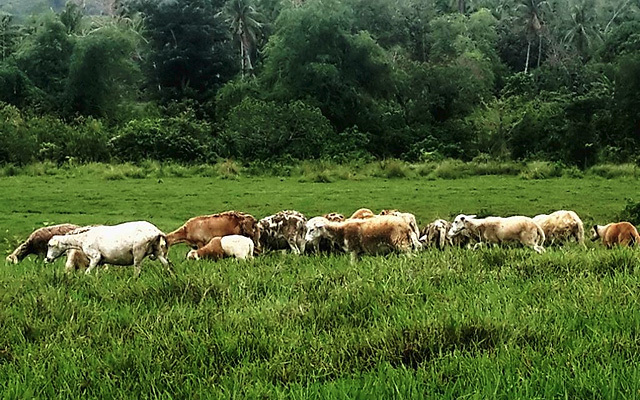 A break from the typical attractions is the Ubay Stock Farm which offers an authentic taste of agrarian living. You can experience milking a carabao and be rewarded with a drink of cold fresh milk. You can also get up close with other ranch animals and live out your cowboy fantasies through horseback riding. 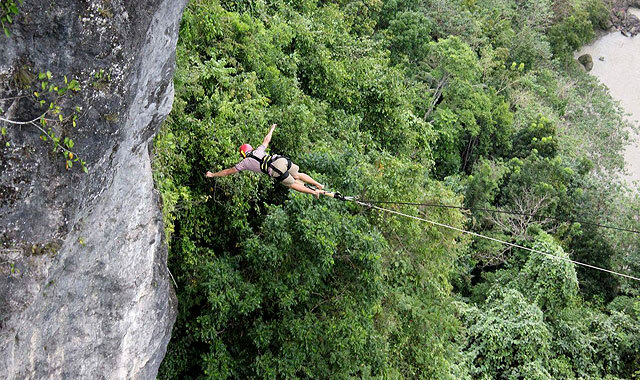 For adrenaline junkies, the Danao Adventure Park is popular for the 500-meter zip line that traverses the hills and The Plunge which is similar to a bungee jump, only more heart-racing. It is also called EAT Danao, short for Extreme, Eco, Educational Adventure Tour, which is an ecotourism project of the municipal government that offers a complete nature experience with a variety of recreational activities suited for all ages. Bohol is a “living museum” with the vestiges of a glorious past that has survived the ravages of time, including the destructive earthquake in 2013. The Immaculate Conception Church in Baclayon, which underwent restoration, is one of the archipelago’s oldest and most-photographed houses of worship. The adjacent Museo de Baclayon is unscathed and showcases the town’s cultural heritage. Another architectural gem is the newly restored Assumption Church in Dauis, which is also known for its therapeutic spring well and well-preserved convent. 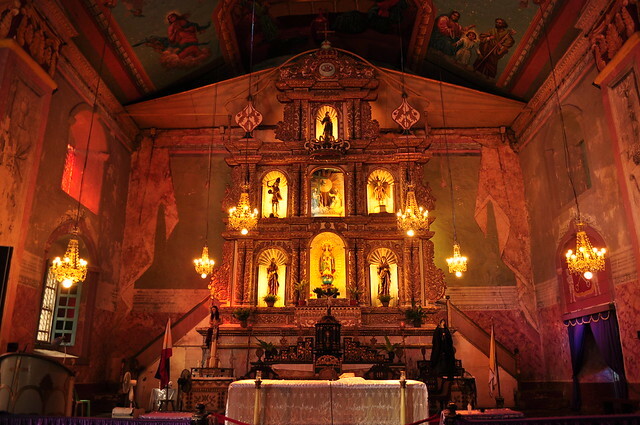 Loay is home to the Santisima Trinidad Church, the 1840 Jose Clarin Ancestral House, and the Sikatuna-Legazpi Blood Compact Site. 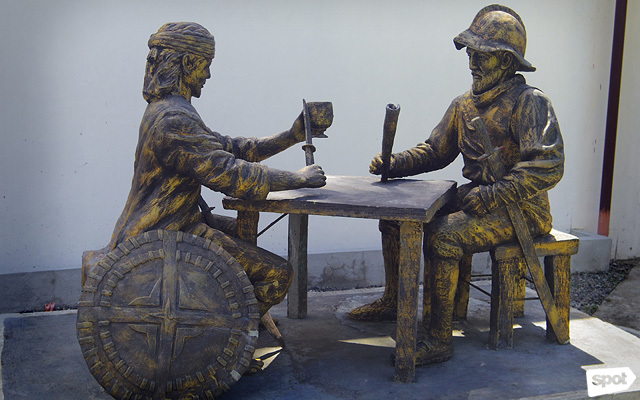 For the longest time, it was believed that the Blood Compact Site is located in Tagbiliran City. The National Historical Commission discovered a more accurate site in Loay, about 15 minutes away. 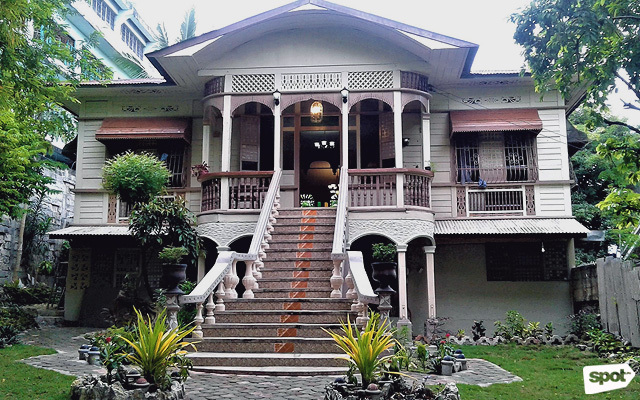 In Tagbilaran, travel back in time at the Bohol National Museum, the Carlos P. Garcia Mansion, and the Balili House. 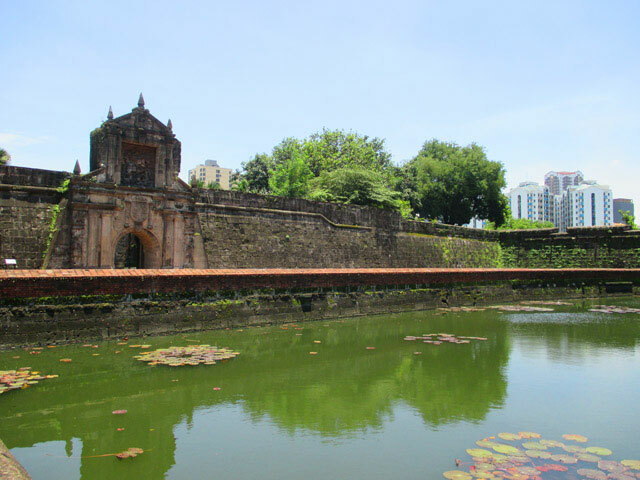 There are also other ancestral homes in the heritage district—Rocha House, Villa Mercedes, and Reyes House, which has a remarkable collection of antiques. 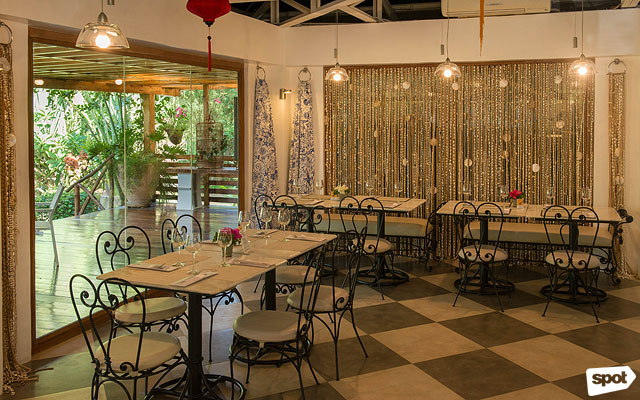 For an elegant dinner out, Tarsier Exotika along Alona Beach has an extensive menu of local and international delights. 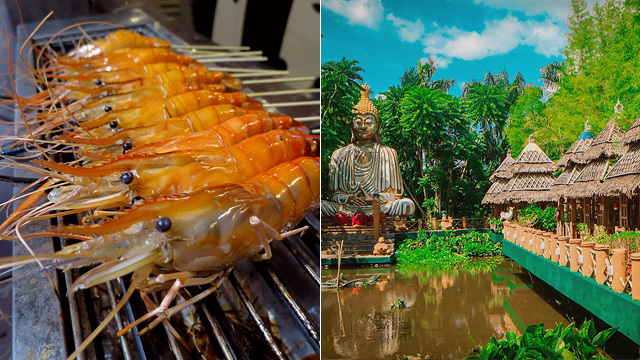 There are other al-fresco restos famous for their inasal, a variety of seafood dishes, and bars in the area. 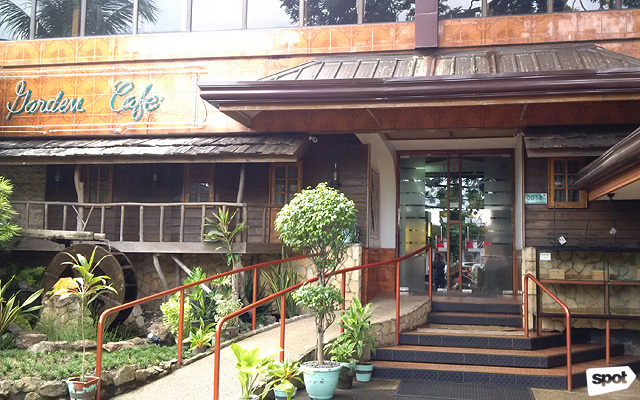 In Tagbilaran, The Buzzz at Plaza Luisa Mall serves the famed organic dishes of Bohol Bee Farm. Garden Café offers old-time favorites in a cowboy-themed restaurant just across the plaza. Aside from serving great-tasting meals all day, it also gives you the opportunity to help deaf-mute waiters and underprivileged students under their employ. 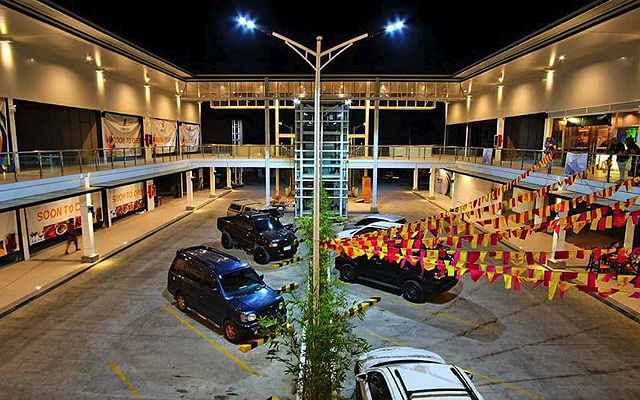 The newly opened Liteport Center in downtown Tagbilaran is a chic strip mall with trendy restaurants, watering holes, hangouts, and tourist-oriented shops. For front row seats to kaleidoscopic sunsets and secluded beaches, stay at full-service hotels such as The Bellevue Resort, Be Grand Resort, Bluewater, or the ultra-luxe Tarsier Botanika—all on Panglao Island. 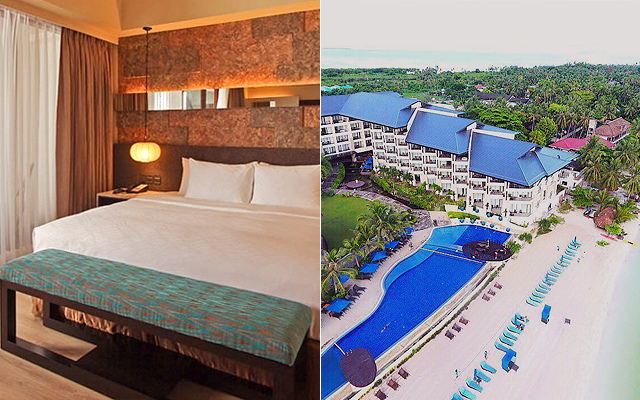 For a more intimate stay, Bohol Bee Farm, Amorita Resort, and Amarela Resort can give you a cozy countryside feel. They also offer a delectable culinary experience despite their small kitchens. In the dive areas, you can stay at the Blue Star Dive Resort in Anda, Paseo Del Mar Dive Resort in Jagna, or Pura Vida in Cabilao. For the mandatory pasalubong for family and friends, visit the Agora Market for handicrafts, kalamay from Jagna or Alburquerque, and Peanut Kisses. A one-stop shop is the Aproniana Gift Shop which has a wide array of souvenirs like key chains, T-shirts, wall decors, local food, and other items. 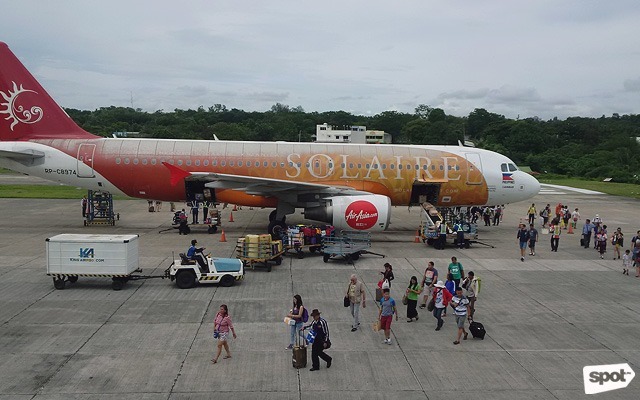 Bohol can be reached by air via Tagbilaran from Manila, Cebu, and Cagayan de Oro. From Cebu, fast craft and ferries sail to the city and the secondary ports of Getafe, Tubigon, and Talibon. From the airport or pier, you can pre-arrange a private vehicle for package tours within the city and around the province. If you opt to commute, there are air-conditioned South Star buses and UV Express vans for inter-town travel at the Dao Integrated Bus Terminal.